Jenan Moussa of Al-Aan TV is the first journalist to get an interview with the lieutenant in charge of Division 30, the 54 fighter force trained and funded by the United States with the ‘stated’ objective of fighting ISIS. A lot of ridicule has surrounded the formation of this group. 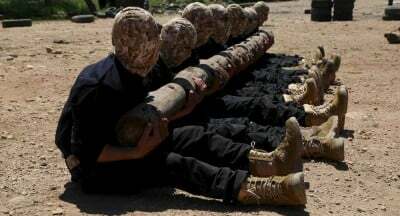 In September 2014, congress approved a budget of $500 million to train & equip a force of 5000 “moderate” Syrian rebels . To the amusement of everyone it took 10 months to train a mere 54 rebels. It proved very difficult for the Americans to find them because the majority of the anti-government rebels on the ground in Syria are Salafists and Takfiris whose priority is to remove Assad rather than fight ISIS. This difficulty was also due to the fact that most “moderate” Syrians actually supported the president. On July 12, 2015 the 54 members of Division 30 entered Syria. As soon as they crossed the border a number of them were kidnapped by Jabhat al-Nusra, a Syrian rebel group affiliated with Al-Qaeda. When the remainder of the group reached their base, they were attacked by al-Nusra. There was a lot of speculation in the media over how many were killed and captured. 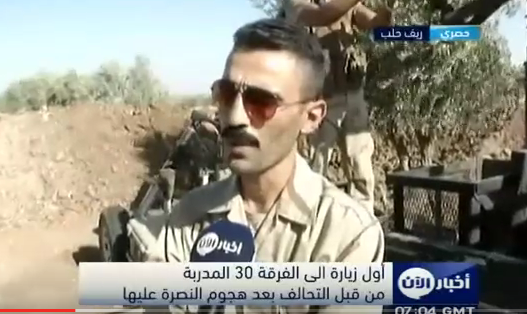 In this interview 1st Lieutenant Abou Iskandar of Division 30 tells his version of events. Abou Iskandar: When we entered Syria on July 12, at around 6 am, there had been previous coordination with the FSA who were providing us with groups of troops that would protect us. We headed towards our base where we were fully provided with weapons. At the time of the Nusra attack only 10 of the 54 fighters were at the base as the rest were away on a rest break. Our entry into Syria and our presence at the base had previously been coordinated with Jabhat al-Nusra. Nusra was being targeted by the coalition for 2 years before our arrival so the accusation that we were the arm of the US and that we were providing the coalition with their locations is not true. Jabhat al-Nusra and all the other groups on the ground are our brothers and we are basically FSA and we’ve been fighting Assad for 4 years so we were surprised by their attack on us. Before the attack Colonel Nadim Hassan was kidnapped. Nadim Hassan is a very decent person and an honorable officer who only wants to serve his country. They said we are agents of the west. We are agents of our country, our nation and our people, nothing more. I want to convey a message: we serve the interests of our country. We are agents of every child in the refugee camps. We are agents of every person who tried to escape to Europe by sea only to die by drowning. We are here to fight oppression and we hope the people will stand by us. So Colonel Nadim was kidnapped by a group of Nusra rebels and we were surprised and don’t know why they did this. Then Nusra attacked us. There were about 40 FSA troops protecting us. Nusra claimed that coalition planes participated in our defense but that wasn’t true initially. We had excellent weapons and our training is excellent. So we are able to inflict losses on any enemy who would come at us. Five of the protective troops who were with us got martyred as well as several Nusra fighters. Now, both of these are our sons and should not die like this. They should be martyred either fighting Assad or Baghdadi’s men who are killing Sunnis. I want to tell everyone, we Sunnis are not terrorists. The sunnis are peaceful and would like to live in peace with all the other sects: the Druze and even the Alawites. We have a lot of Alawite friends. Our fight is with Bashar. Our problem is not training. Our problem is the lack of a no fly zone. Give us that and we will not need training from any outside country. And we will not go back to Europe. We thank all the countries that helped us. Jenan Moussa: When you say you coordinated with Jabhat al-Nusra what does that mean? How did you make sure that that they would not attack you? Also was Colonel Nadim Hassan kidnapped at the border crossing as soon as he entered Syria or later? Abou Iskandar: We are required to coordinate with all the fighting groups. There were contacts made with Nusra a week before we entered. Four months ago, Nusra expressed that they are all for our program. They said : go get arms and come and fight Daesh. You will relieve some of the pressure that’s on us. So we were surprised by what they did and we still don’t know why they kidnapped Colonel Hassan who is a very decent man with not one black spot in his revolutionary life.We are willing to fight anyone who attacks Division 30 and no one should say that the coalition is with us. Just our men who were trained in the program who acquired great expertise. Don’t underestimate the number 54. Besides we are not 54. There are thousands of us. There are many who are helping us on the ground. Jenan Moussa: Tell us about the training of the 54 and what kind of weapons they have. A lot of people are saying that your weapons were seized by Jabhat al-Nusra. And what is left? And regarding the 54, where are they? How many are left? And also there are reports that Nusra released 7 men? What is your comment? Abou Iskandar: All our weapons are still with us. Nusra never reached our base so they did not get any of them. As for the 54, they are not all here now but all are well. The men who died in the attack were of the protective troops not of the 54. There are 33 here now. Five were were kidnapped by Nusra but have now been released. So all 54 who were trained in the program are alive. Jenan Moussa: How did the release of the five come about. Abou Iskandar: I believe it was through negotiations with their families. Jenan Moussa: As for the strike that the coalition made to help you at the time of the attack did you request it? Abou Iskandar: The coalition have tracking equipment and can tell where every one of us was during the attack. Naturally they helped us. Its normal. They promised that they will aid us in case anybody attacks us, even the regime. Jenan Moussa: Don’t you consider that the Americans throwing the 54 of you here was wrong? What can 54 men do in view of the large number of extremist groups on the ground? Just by the fact that you were trained by the Americans, you have been branded and have become a target for these groups. Wouldn’t it have been a good idea to wait? Do you hold any grudges against the Americans for this? Abou Iskandar: You in the media keep saying the Americans. You should say coalition. The Americans are merely part of the coalition. The coalition has provided us with so much. At this point, Bashar is the enemy and he’s going to fall, but who is the alternative? Who will take his place? He is going to fall. If we had a strong army with unified command we could remove him in 48 hours. But presently who is the alternative? Can we hand over the coastal area to Daesh? We can’t accept such a thing. We came here to fight Daesh and relieve the people from its oppression. Raqqa. Women are being sold in auctions. Yazidi women are Syrians. Jenan Moussa: How were the 54 chosen? Why you specifically? Abou Iskandar: We applied for the training. The program was supposed to graduate 54 men every month and we are the first group. We were supposed to come and fight Daesh and we had no idea anyone else would attack us. Some people belittle the number 54. Some of us are excellent snipers. Other groups specialize in live contacting and specifying targets against Daesh. The 54 of us are going to work with the FSA’s operation room. Besides, we ourselves are FSA.